Dr. M.V. Krishnan was one of the founding members of the College of Music and Fine Arts, established in 1950 at BHU. It was his exemplary vision as a sculptor and as an academic that paved way for steady rise of the Department of Plastic Arts and its contributions to the field of Sculpture, Pottery, and Ceramics. The legacy of his vision was befitting carried forward by stalwarts such as Ajit Chakravarty, Kalindi Vedan Jena, Dineah Pratap Singh, Balbir Singh Katt, Ram Chatpar, P. Chandravinod, Latika Katt, A.C. Bhattacharya, Tapan Santikari, and Sudhir Kumar. Madan Lal Gupta, Mrigendra Pratap Singh, Brahma Swaroop, Amresh Kumar, and Nitin Dutt are unconditionally committed towards the vision of the Department of Plastic Arts and to the propagation of quality education in the area of sculpture. To imbibe our students with professional and practical competence. Imparting students with ability to consistently search within to attain personal, creative, and conceptual clarity. 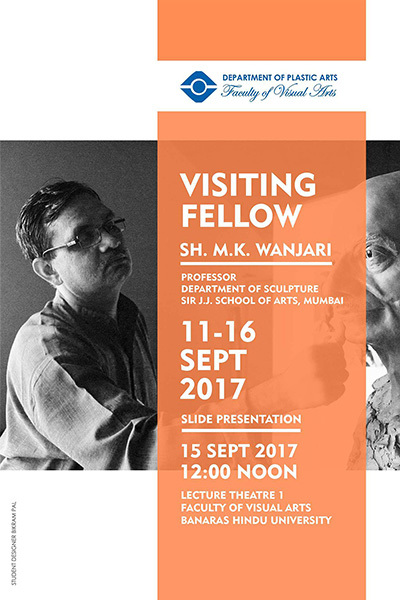 To encourage among students a cross-disciplinary and inter-disciplinary approach in order to develop, achieve, and propagate strength of sculpture as a field of Visual Arts. 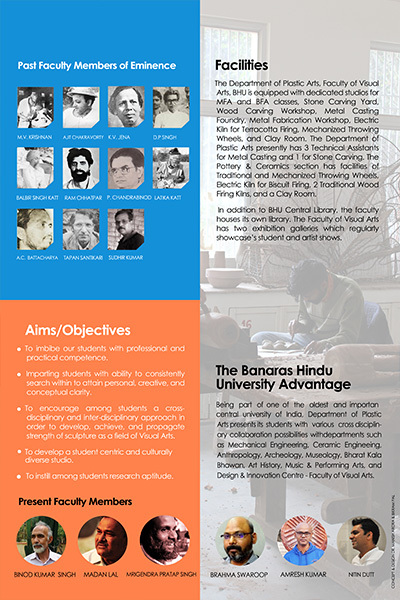 To develop a student centric and culturally diverse studio. To instill among students research aptitude. 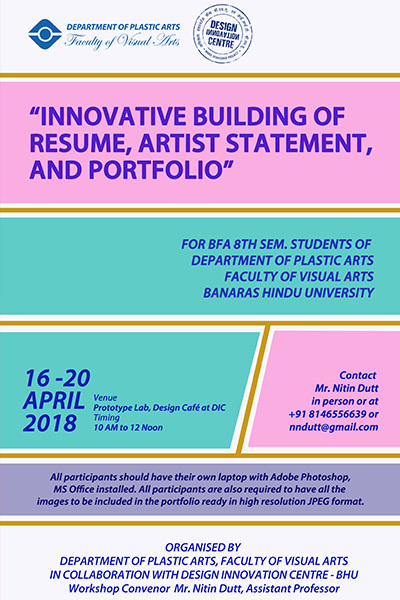 The Department of Plastic Arts, Faculty of Visual Arts, BHU is equipped with dedicated studios for MFA and BFA classes, Stone Carving Yard, Wood Carving Workshop, Metal Casting Foundry, Metal Fabrication Workshop, Electric Kiln for Terracotta Firing, Mechanized Throwing Wheels, and Clay Room. The Department of Plastic Arts presently has 3 Technical Assistants for Metal Casting and 1 for Stone Carving. The Pottery & Ceramics section has facilities of Traditional and Mechanized Throwing Wheels, Electric Kiln for Biscuit Firing, 2 Traditional Wood Firing Kilns, and a Clay Room. In addition to BHU Central Library, the faculty housed its own library. 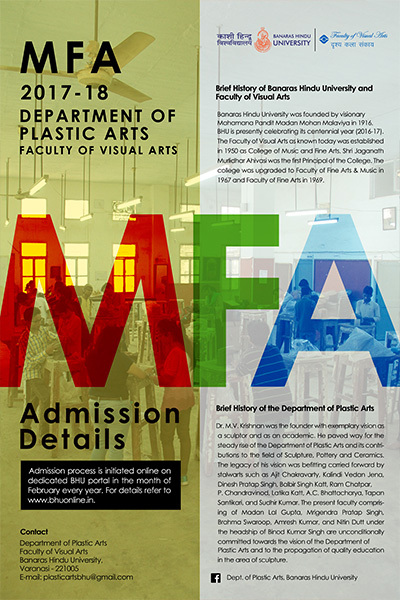 The Faculty of Visual Arts has 2 Exhibition Galleries which are open to curated shows from artist across India and for student shows upon approval. Admission process is initiated online on dedicated BHU portal in the month of February every year. For details refer to www.bhuonline.in.